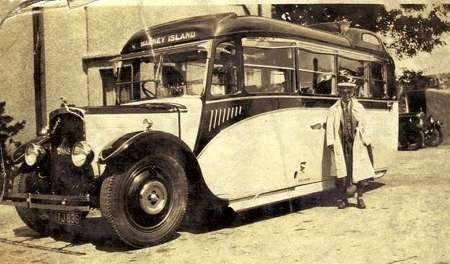 So far as I am aware, Entwhistle & Sons of Morecambe, trading as Prince of Wales tours, only ever had two vehicles. I offered a view of ETC 760B a while ago. 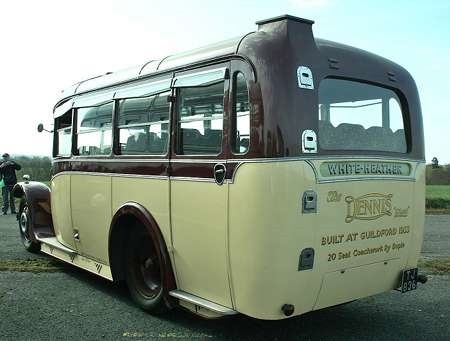 Here are two views of their first, a 1933 Dennis Dart with Duple C20R body, with door. After thirty years of regular service, it was retired – ETC 760B being the replacement – and it has now returned to its birthplace, Guildford. It is now in the care of Alexander Dennis and we see it at Wisley on 5 April 2009. Quite why it has a White Heather illuminated rear panel I do not know. It carried it in her normal working life, too! Sorry, Pete, I think you’ve got one or two things wrong, there. TJ 836 was new to Entwistle (no ‘h’) of Morecambe, but later operated for Jardine (t/a ‘White Heather’) also of Morecambe. 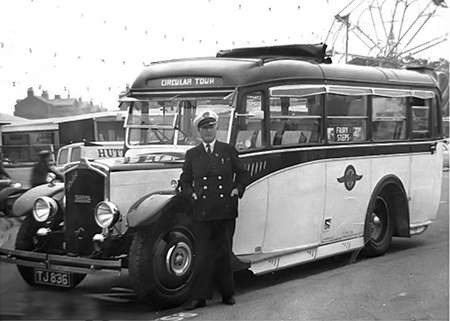 I would imagine that the transfer took place in 1949/50 since that is the year in which Entwistle took delivery of a new Pearson-bodied Bedford OB – the registration was something like LTD 986, although that possibly isn’t quite right. It was this OB which was in turn replaced by ETC 760B in 1964. ‘LTD 986’ went for further service with Hay, of Kintore, Aberdeenshire. 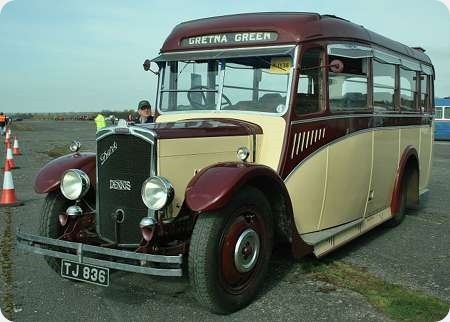 Frank Entwistle died in the late 1970s (I think) and ETC 760B passed to the partnership of Gerry Lamb and Neville Lacey (of Morecambe) who were already operating a coach of their own (a Bedford VAM, I think), under the name ‘Regent Travel’. IIRC correctly ETC 760B continued to be operated under the name ‘Prince of Wales’ for several years. ‘White Heather’ ceased operation when Mr Jardine died (I think this was the late 1950s). TJ 836 was sold shortly afterwards, but still stored in the Jardine depot at this time was TE 8318, a Chevrolet new to Jardine in 1929. I have read (on a Flickr caption) that TE 8318 and TJ 836 were operated by Jardine concurrently, but I didn’t think that that had been the case, although I don’t know for sure. In addition to TJ 836, TE 8318 and ETC 760B are, I think, still preserved. There is a nice shot of TJ 836 in service with Jardine on Flickr. Can anyone explain, please, what the chimney-like protuberance is, at the nearside rear corner of the roof, above the fold-down steps? Such steps would normally lead to a roof-mounted luggage carrier of some sort (as found on, say, 50s Royal Blue coaches), but I can’t see any way you could keep luggage in place on this one. David, You are indeed correct as regards the spelling with or without the ‘H’. 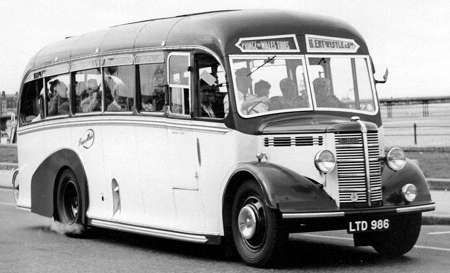 My schooldays were spent in Lancaster and Morecambe and I distinctly remember TJ running in the livery shown in the early 1960’s, and then ETC. I have no recollection of the OB. The Chevrolet has appeared on these pages in the past it can been here. I didn’t know that TJ had been with Jardine. With regards to the luggage rack, I think this would have been a recess in the roof with a waterproof cover that could be pulled back over the luggage (see attached pic) where you can see the cover rolled up on roof. I think the roof has since been panelled over. I don’t know what the square ‘chimney’ protrusion is, being in line with the steps it must have got in the way of the driver when putting cases up on roof. One thought would it have been a vent of some sort? It’s the smoke outlet from the boiler Graham. The fireman’s door is just next to it. The coal is stored just next to the number plate. The luggage locker is at the front. Nearly right, Joe, the vehicle was actually powered by peat! That’s a lovely photo, John W, which made me wonder if the roofbox had a winding handle inside for the luggage cover, perhaps. Frank Entwistle was my second cousin and his father, Harry, my great uncle. TJ 836 originally had a roof box for luggage, see attached photo. 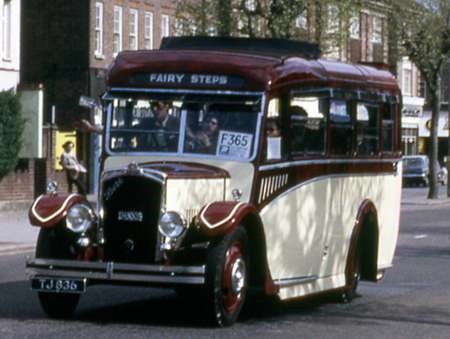 The coach which followed the Dart was indeed a Pearson-bodied Bedford OB reg LTD 986. There were previous coaches to TJ 836 and before them horse-drawn Landaus. The Bedford OB which followed the Dart was LTD 986, as shown in the attached photo. I think that you see a few frames of this bus, or one looking like it running right to left across the picture at about 19mins and 56secs in. In this picture, taken at South Croydon in May 1972, the folding roof was still fitted.